What can you do to prevent or control high cholesterol? Cholesterol is a fat-like material that provides structure for your body's cells. Your liver makes most of the cholesterol your body needs, but you also get some from the foods you eat. Too much cholesterol can cause a sticky substance (plaque) to build up in your blood vessels. This plaque can block blood vessels and cause heart attacks and strokes. Most people with high cholesterol feel healthy and don't have symptoms. The only way to know if you have high cholesterol is to have your cholesterol checked. Cholesterol is checked with a blood test. The test works best if you don't eat or drink anything for at least 8 hours before the test. Your total cholesterol is made up of two types of cholesterol: LDL (low-density lipoproteins) and HDL (high-density lipoproteins). High levels of LDL increase your chances of heart disease. It is sometimes called the "bad cholesterol." High levels of HDL decrease your chances of heart disease. It is sometimes called the "good cholesterol." Your provider will usually look at your total cholesterol first. 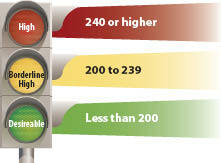 Your total cholesterol should be under 200. If you already have heart disease or you have heart disease risk factors, such as smoking, diabetes, or high blood pressure, your provider will also look at your LDL and HDL results. If your cholesterol is in the desirable range and you are healthy, have it checked again in 5 years. Do I need treatment for my cholesterol? Read food labels and limit foods high in saturated fat, trans fat, and cholesterol. Eat plenty of fruits, vegetables, low-fat dairy foods, and whole grains. Always ask your provider what your cholesterol numbers are and write them down. Keep track with the log at the MyHealtheVet website: http://www.myhealth.va.gov. Your provider may prescribe medicine to help lower your cholesterol. Take your medicine every day, or as directed by your provider. If your cholesterol numbers get lower, it's because your medicine is working. Don't stop it or take a lower dose unless your provider says you should. Is my cholesterol under good control? When should I have my cholesterol next checked?